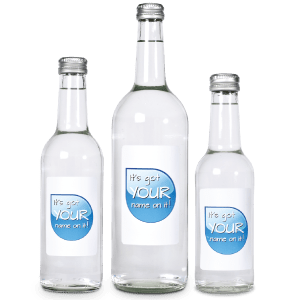 Our sleek and classically styled glass bottle is perfect for gracing any venue or corporate event. Bottle colours : Clear (all sizes). Cap types : Metal screw caps. Standard label spec : Full colour plus high gloss varnish on waterproof white polypropylene permanent adhesive. 330ml = Front label size 55mm wide 75mm high (Portrait). 750ml = Front label size 64mm wide 98mm high (Portrait). Contract rates for promotional water are negotiable. FREE design based on mac format logo supplied, using our standard template. Lead time : Allow 3 working weeks from artwork approval to delivery. Please call the sales office if you require a quicker delivery, we will always endeavor to meet your needs.